The 3D sensor rc_visard provides real-time camera images and disparity images, which are also used to compute depth images and 3D point clouds. Additionally, it provides confidence and error images as quality measures for each image acquisition. The sensor provides self-localization based on image and inertial data. A mobile navigation solution can be established with the optional on-board SLAM module. The rc_visard is an IP54-protected sensor that offers an intuitive web and a standardized GenICam interface, making it compatible with all major image processing libraries. 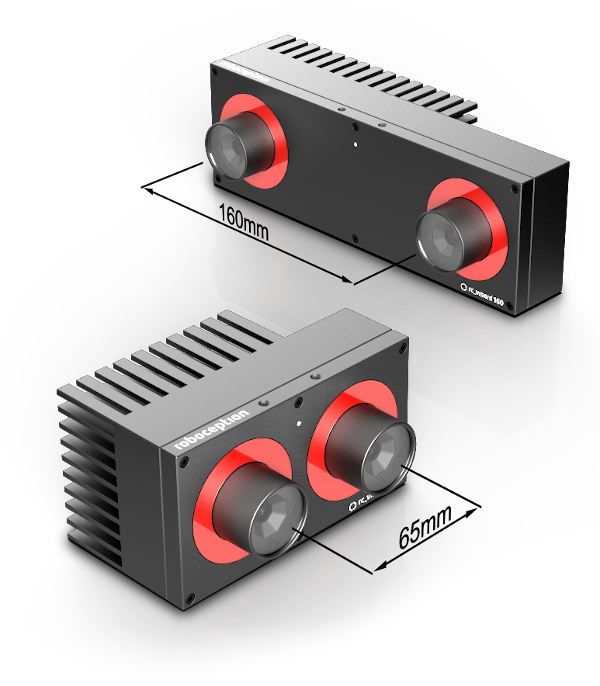 The rc_visard is offered with two different stereo baselines: The rc_visard 65 is optimally suited for mounting on robotic manipulators, whereas the rc_visard 160 can be employed as a navigation or as externally-fixed sensor. The rc_visard’s intuitive calibration, configuration, and use enable 3D vision for everyone. The terms “sensor,” “rc_visard 65,” and “rc_visard 160” used throughout the manual all refer to the Roboception rc_visard family of self-registering cameras. Installation and control for all sensors are exactly the same, and all use the same mounting base. Unless specified, the information provided in this manual applies to both the rc_visard 65 and rc_visard 160 versions of the Roboception sensor. This manual uses the metric system and mostly uses the units meter and millimeter. Unless otherwise specified, all dimensions in technical drawings are in millimeters.